Description: Razor is one of the Gamemasters and a creator of Greed Island. Razor was entrusted by Gon's father that he was not to hold back against his son should he ever comes to Greed Island. Razor is a tall and well built man by appearance and perhaps likes to play sports (especially ball games) as a pastime.Razor is a key person in getting one of the hardest designated card of the game. To get the card, the challengers must confront Razor and his 14 devils. It was learned that the 14 devils were not the pirates that follows him but his ability to emit 14 nen creatures at will. He can also emit nen into a ball (or create a ball from nen) and throw it at his opponent, which is extremely strong and could critically injure or kill his opponent on a direct hit. He was defeated in a deadly dodgeball game by Gon's allied party (consisting of Gon, Killua, Biscuit, Hisoka, and several other hunter/players hired by Battera).Razor later revealed to Gon that he was a former convict along the same as the pirates here whom were exiled to Greed Island. Razor is also the warden of these convicts. 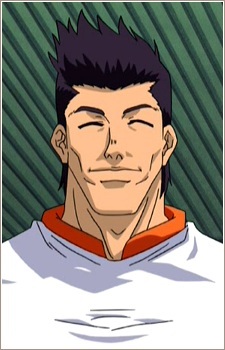 He became one of Ging's best friends and entrusted to look after the island as one of the Gamemasters.